One of my go-to recipes when I don’t have a lot of time to cook. This is one of those recipes that started out as something else and over the years has evolved into what it is now. Does that make sense? OK, how about this. Before I had Cat I had the time to chop up all the veggies and mix them up to make this dish. I may have even taken the time to cook the beans and scrape the corn right off the cob. Now that I am a mom my time in the kitchen is limited, especially since most nights I play single mom while Craig is at work. So I’ve had to take some shortcuts. Now my homemade salsa comes in a jar. See? Evolution! This recipe is just enough for one person to eat two to three meals or for two people to share. Go ahead and double it if you want more. You can add more ingredients if you are serving a big crowd. I made a small batch since it was just for me. OK, so drain and rinse your beans and corn. Then mix together in a bowl, salt and pepper to taste. Then add a quarter cup of salsa. You can add more if you like, but let’s start with just this much. Mix in some diced red onions and cilantro if you are using it. 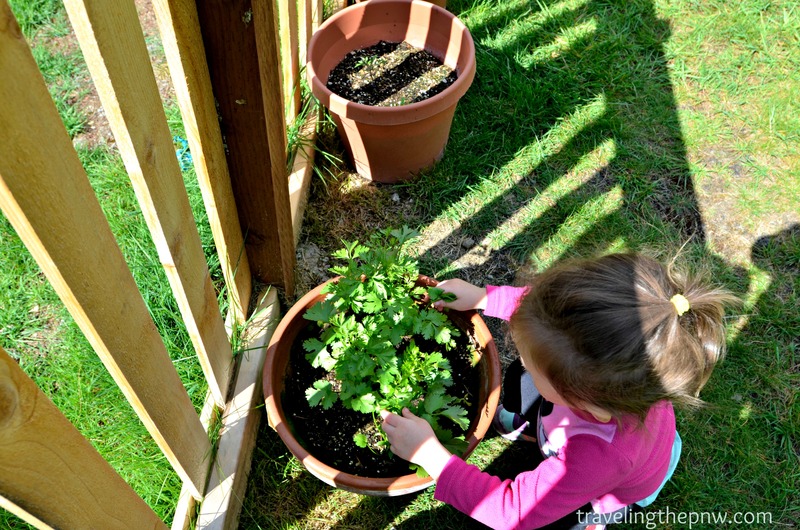 The one time I am encouraging Catarina to pick the plants in our garden. I am using cilantro from our garden. Catarina was kind enough to pick some for me. Finally squeeze the lime juice in and mix. Voila! 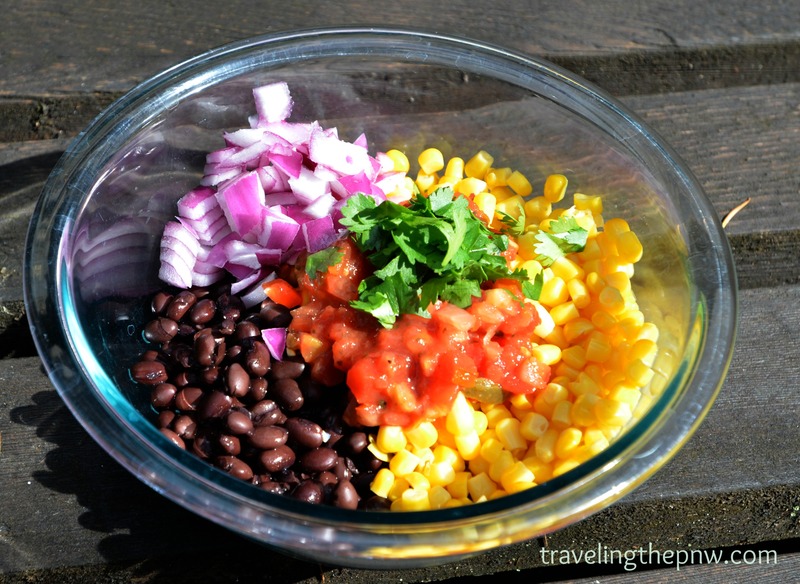 Black bean corn salsa that you can eat as a meal! I like to spoon this into some romaine lettuce leaves for a healthy meal, but if you figure this is healthy enough than dig in with tortilla chips. The salsa you use will be the deciding factor in the taste so be sure to use one you are familiar with. You can always experiment with different brands later, but I want you to like my recipe so please stick with what you like. I used Rojo’s pico de gallo to keep it fresh. 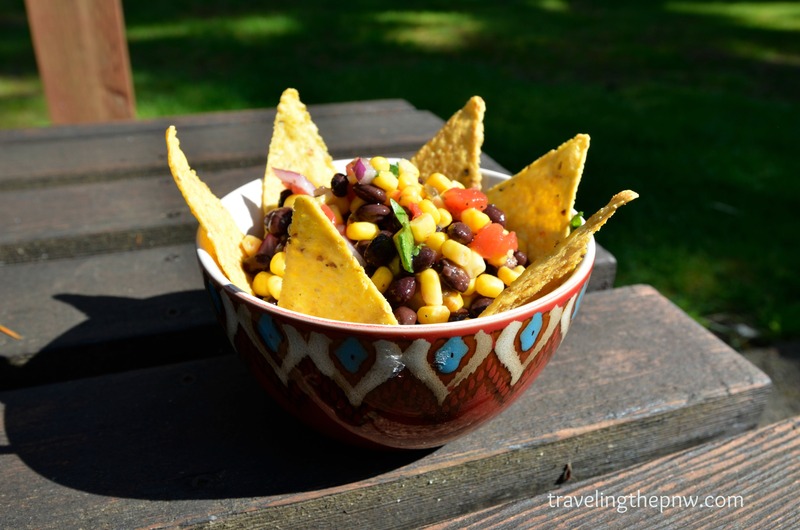 The black beans make this a filling dish so it can be eaten as your main course. You can also add diced avocado to really jazz it up! The mixture also makes a great taco meat replacement. 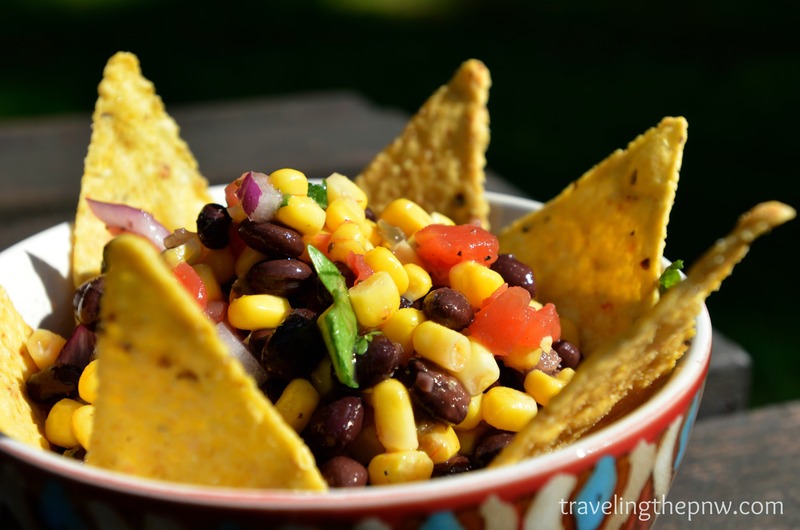 Just wrap in corn tortillas and enjoy! This is also a great dish to make for a potluck or while camping because you can eat it warm or cold and you don’t have to worry about it spoiling. Would you like more easy vegan recipes like this? Keep reading this blog and we’ll provide some more as the summer wears on. I’m a pretty lazy cook so I’ve got a bunch of these.